so, as you might expect, we have been excitedly looking for all manner of weird and wonderful sea creatures – I’ve been in my element! My highlights for this trip included snorkelling with an inquisitive dugong (Dugong dugon) in northern Batanta Island, observing and photographing my first baby Pewter angelfish (Chaetodontoplus dimidiatus) in Aljui Bay in northern Waigeo and seeing a tiny newborn tasselled wobbegong shark (Eucrossorhinus dasypogon) back in Batanata. It struck me that the words ‘wobbegong’ and ‘dugong’ must have a similar derivation, so I contacted my dear friend, and wobbe-botherer, Jo Stead to clear up the origin of the shark’s name. Apparently, ‘Wobbegong’ means ‘bearded fish’ in an aboriginal Australian language. I need to do more research, but I imagine ‘dugong’ must also mean ‘something-fish’. In any case, the dugong was my first ever in-water experience with these elusive mammals. I went snorkelling with one of the trip’s guests, Holmes. Something caught my eye, I looked into the distance and the dugong came towards us. It circled several meters below us before swimming off after what seemed like hours, but was more likely tens of seconds to a minute. No less exciting, was the baby wobbegong shark. It was so small it would have fit in the palm of my hand. Wobbegongs are live-born, and resemble miniature versions of their parents on birth. It sat motionless in the centre of a vase sponge, waiting for some prey to happen past it. The baby pewter angel was also a great sighting. These fish are found only at scattered locations of northeast Indonesia, and it seems that relatively few images exist of the adults, let alone the juveniles too. Whilst you may have heard about the impending global coral bleaching event that is being tracked by NOAA scientists, I am happy to report that I have made no observations, as yet, of coral bleaching from Raja Ampat. Coral bleaching events, such as the massive one in 1998 that killed 16% of the world’s hard corals, are a result of the El Niño phenomenon and are a very real threat to the coral reefs of the world. Although fine at the moment, the warming waters that cause bleaching are forecast to spread over the coming months, so we will have to wait and see how the world’s reefs fare with this onslaught. Check out this link to read more about the present global bleaching event forecast – it’s a sobering read. Funnily enough, Raja Ampat has been facing the opposite effect recently. We have experienced relentless and unseasonal south winds with unexpectedly cool waters for this time of year. Usually 28-29˚C, we have had at least 2-3˚C degrees less than this at several of the sites we’ve dived. Luckily, we planned to stay north for this trip and have enjoyed stunning visibility in the Dampier Strait and been able to dive in some areas of north Waigeo, which are usually inaccessible. We’re already very excited about the next trip, which promises some exciting diving as ever! If you’d like to see some more of my images from the trip, please check out my gallery HERE. Originally written for BirdsHeadSeascape.com, and based on this trip, I wrote about my recent rekindled interest in damselfishes for their blog ‘Bird’s Head Natural History Notes: In Appreciation of Damsels‘. You can read this on the fantastic BHS website by following this link (coming soon) or read below. The BHS is an online collective, funded in part by Conservation International (one of the beneficiaries from our own ‘Our Beloved Seas’ trip donations – OceanRealmImages.com/Expeditions). They aim to spread the word about the amazing area that is Raja Ampat and inspire the important region’s conservation. Check out their website for a mine of information about West Papua and the Bird’s Head Seascape. An update is long overdue but I’ve fallen sadly behind on blogs of my travels, publications and exciting marine life finds of late. There’s a lot to catch up on here at Ocean Realm Images! Since my last blog, I’ve completed several more successful trips as group leader; both alone and with Wendy Brown as ‘Our Beloved Seas’ trips. The trips have included Tubbataha and Dumaguete in the Philippines, Alor, Wetar and Wakatobi in Indonesia and most recently Northern Raja Ampat (follow links above to galleries and trip reports). We saw some amazing marine life living where it shouldn’t (The thinline wobbegong shark (Orectolobus leptolineatus) in Alor and the mimic jawfish (Stalix sp) in Dumaguete) and several firsts for me – including species for which very few sightings have ever occurred (Humann’s fairy wrasse (Cirrhilabrus humanni), new species of flasher wrasse in Alor (Paracheilinus sp. ), soft coral pipefish (Siokunichthys breviceps) and harlequin grouper (Cephalopholis polleni)). Wendy and I are very pleased that so far from our three trips, we’ve been able to pass some of the proceeds to conservation efforts specific to the regions we’ve visited. So far we’ve donated $1500 to help the amazing work of the conservation charities Save Our Seas Foundation and Conservation International. We both think it’s hugely important that we give something back to preserve the oceans that we love so much. We hope you agree! I have also started a new and exciting venture with Dive Worldwide, a UK based diving company for whom I will start leading trips as of February 2016. I recently gave a talk about our upcoming Philippines trip at London’s Russell Square Hotel. The talk went very well, and it was apparently the best attendance they’ve had. It was great to meet some of the folk who have already signed up and those who since have. Keep your eyes peeled on my social media (Facebook and Twitter) for details of my next talk with them, which is currently in the planning stage. 12-21st September 2015 | Philippines | Land-based stay at Atlantis Dumaguete Resort. 12-22nd December 2015 | Solomon Islands | Live-aboard trip on Bilikiki. 21st February – 2nd March 2016 | Philippines | Trip with Dive Worldwide to Atmosphere Resort, Dumaguete. 18-29th March 2017 | Indonesia | Trip to Triton Bay aboard Dewi Nusantara. Only one cabin remaining. I’ve been extremely busy writing for various publications around the world. Since my last update, I have begun writing a regular monthly column for Sport Diver magazine in the US, called ‘Species’, which has so far covered: Crinoids, Goliath Groupers, Caribbean Spiny Lobster, Sea Stars and Whale Sharks. I also completed my five part series in British Sport Diver magazine ‘Photographing Behaviour’, and have now begun a new series ‘Critter Hunting’. I’ve also had a series ‘Mini Breaks’ in Sport Diving magazine and a couple of cover shots with them too. In addition to those regular features, I’ve also had pieces in Wild Travel magazine, Action Asia, Depth Magazine, Aquanaut, Silent World, X-Ray magazine, Diver, Dive! I’ve been busy to say the least! Finally, if you like moving images, I have recently started shooting HD video with my D800 SLR camera. The first video that I’ve put together is now up on my YouTube channel ‘Diving The World’s Richest Reefs – Raja Ampat, Indonesia‘. Check out the link and I hope you enjoy it. In the darkened salon of Dewi Nusantara on the last evening of the trip, Martin and Kelly were sharing their fantastic images taken over the past eleven days. Having this opportunity to see a collection of pictures from the trip gave me a real sense of the amazing diving we’d been lucky enough to experience. 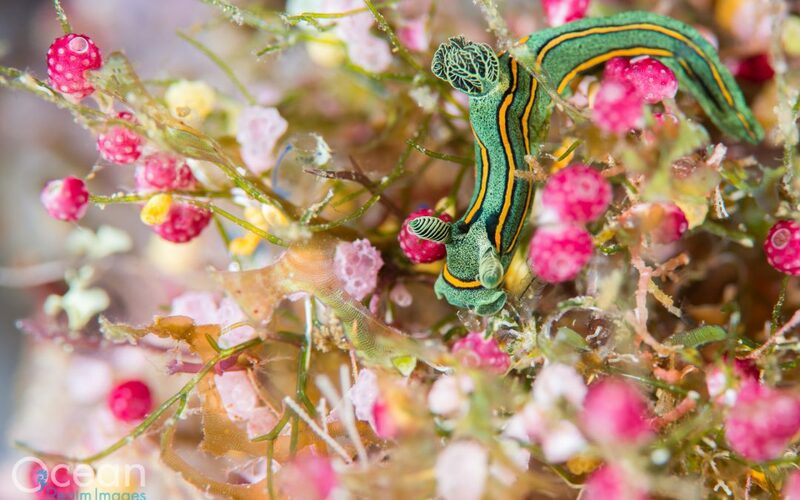 Among his pictures, there were many unusual nudibranchs (several of which I’d never seen before), shrimps such as the elusive harlequin and Coleman’s species, pristine reefs and blue-ringed octopuses – to name just a few. Wendy and I, who together make up ‘Our Beloved Seas’, had tailored this trip to explore northern Raja Ampat. As with all our trips, we planned to dig a little deeper and get off the beaten path with our voyage. We visited only the northern two ‘Kings’ of Raja Ampat: Batanta and Waigeo Islands. Usually, charters also head far south to visit Misool Island too, so this gave us much more time to visit some sites we’d had on our radar in the north for a while. The trip was off to a bang in northern Batanta. Our quarry in the small and unassuming bay, which was our first stop, was a very special fish indeed. The picturesque dragonet (Synchiropus picturatus) is, in my opinion, the more beautiful cousin of the mandarinfish. Whilst the ostentatious mandarin is most well known for its coital displays that take place at dusk each day, there was none of this lewdness with our picturesques. These turquoise fish, covered in psychedelic rings, were going about their business on a rubble and coral slope. Although I haven’t seen one in eight years, I must have seen at least a dozen in the hour we spent scouring the slope. We then surfaced to another natural spectacle as dozens, well 140 by our count, of Papuan or Blyth’s hornbills (Aceros plicatus) came to roost on the island adjacent to where we’d been diving. We could hear the characteristic whooshing of these huge birds as they flew overhead in pairs and small groups. Our next day was spent with equal numbers of special fishes; they were just several orders of magnitude larger than those from the previous day. Wendy had found a new manta cleaning station and we spent two dives cruising between the coral outcrops that accommodated the cleaner wrasses that drew the mantas to the site. It must have been manta rush hour at the site, there was an almost incessant stream coming to be cleaned. At one point I was buzzed by a squadron of five pure black ‘Darth Vadar’ mantas. Whilst the black form isn’t uncommon, I had never seen so many at one time. Heading further north, we spent a couple of days in the bountiful Dampier Strait area, diving the world’s most biodiverse coral reef (well, that is according to a fish species count undertaken by Dr Gerry Allen a few years ago). We saw white tip, black tip, grey and wobbegong sharks, which is sadly quite an extraordinary species count for anywhere in southeast Asia these days. Turtles and large clouds of fishes complemented the little creatures such as Pontoh’s and Severn’s pygmy seahorses, flamboyant cuttlefish and ghost pipefishes. Next was Aljui Bay, one of my favourite places to dive in Raja Ampat, if not the world. The topside scenery is extraordinary and the underwater world is equally unexpected. I have seen several unique Denise’s pygmy seahorse associations with the gorgonians here. On this trip we saw Denise living on an Echinogorgi gorgonian in a colour form that I hadn’t seen previously. The pygmy was bright red and white, much like the form of Denise seen more commonly in the south of Raja Ampat. The ever-rewarding night dive at Cendana Dock pearl farm didn’t disappoint. Between us, we had many cephalopods such as white-v octopus, bobtail and bottletail squids, as well as other treasures including toadfish singing and waspfishes. During the night after leaving Aljui, we passed over the equator into the northern hemisphere on our way up to Wayag. This beautiful island group is the poster child for the whole of Raja Ampat. The view from the top of one of the hills across the islands is stunning, as are the islands at sea level. After three current charged dives, where I saw bigger schools of trevally than I’ve ever seen anywhere before, we went on a little boat trip round the islands. Out of the azure waters burst steep limestone mountains covered in spartan tropical growth. Several days’ diving and cruising southwards found us finally sitting back in the waters off Batanta Island, with just two muck dives remaining on a site called Algae Patch. Although the currents into the channel between Batanta and Salawati were ripping, we had nice calm conditions for our dives. The list of critters clocked up by the whole group during these two dives was outstanding. Many amazing nudibranchs were firsts for most of our guests, ghost pipefishes and hoards of unusual shrimps made up the roster. Although the trip absolutely flew by, I’m pleased to be diving with many of our guests again very soon. The Philippines trip is just round the corner in September, which many are joining. Although the next trip with spaces isn’t until March 2017, when we will be sailing from Sorong to Kaimana taking in the rarely explored highlights of the Fakfak coast and Triton Bay. For more information about our upcoming trips check out my expeditions page, or contact me. For images from this trip, check out my album. Following the success of my recent trip to the Philippines aboard Atlantis Dive Resort’s ‘Azores’ I am pleased to announce that I will be leading another trip on this lovely vessel from 19-28th September 2015. This time we will circumnavigate the island of Cebu diving with whale sharks, pygmy seahorses and snorkelling with whale sharks! Of course I’ll be giving informative marine life talks about the creatures and life we’re seeing, and will be on hand to talk fish or cameras (check out testimonials from previous guests here). Read more about this trip below, or download the trip flyer at the bottom of the page. 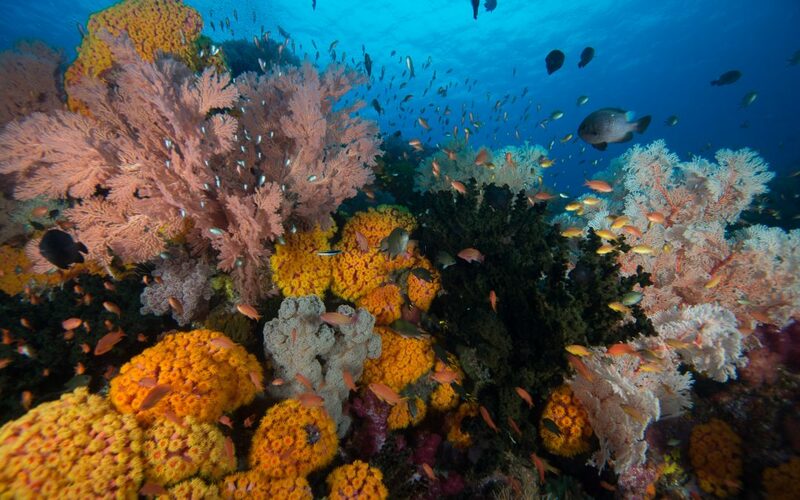 The Philippines is located within the ‘Coral Triangle’, an area with the world’s greatest marine biodiversity. We will join the luxury Azores liveaboard on its Malapascua and Cebu itinerary, an area at the heart of the Coral Triangle. The trip will take in the best diving the Philippines has to offer, and includes rare opportunities to observe elusive thresher sharks, dive with mantas and snorkel with whale sharks. Due to its central location within the Coral Triangle, there is also opportunity to see many of the reef’s unusual critters too, including pygmy seahorses, ghost pipefish, frogfish…the list goes on! 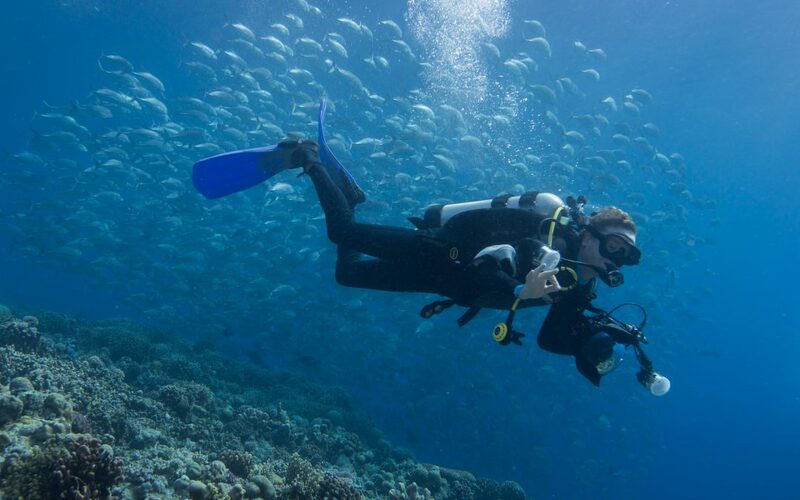 Richard will present daily marine life lectures about the area’s reefs and will be on hand to answer any questions, help identify creatures we come across on dives and provide pointers and tips for capturing the shots you want. The 10 night itinerary takes in some of the best diving that the Philippines have to offer. Departing from Dumaguete Resort, a sister resort of the Azores, the tour will circumnavigate the island of Cebu taking in many great sites over the ten night cruise. Highlights of the trip include the world famous thresher shark cleaning stations off Malapascua in northern Cebu, where these unique long-tailed sharks are cleansed of unwanted parasites by hoards of hungry fishes. Baitballs and schooling trevally are likely to be spotted at several sites, but Pescador Island off western Cebu is known as the site of the ‘Asian Sardine Run’. Capitancillo is a rarely dived location, due to its distance from any land-based operators, but offers interesting cavern systems providing unique photographic opportunities. 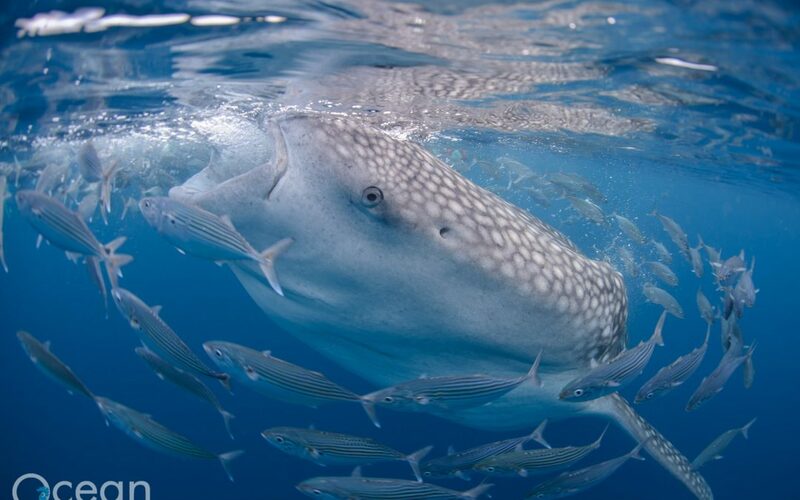 Last but not least, we will be snorkelling within inches of the world’s largest fish: wild whale sharks, which are attracted by fishermen feeding them tiny krill. Why not join Richard on this trip of a lifetime! Dr Richard Smith is a British born marine biologist and underwater photographer. He has written dozens of articles, published internationally, with a focus on marine life and conservation. In 2011 Richard was awarded the first PhD on the biology of pygmy seahorses. With an undergraduate degree in Zoology and Master’s in Marine Ecology he has a broad knowledge of both terrestrial and marine biology to enrich your trip. AZORES LIVEABOARD The Azores has set new standards in liveaboard diving for the Philippines. Azores is the perfect place from which to explore some of the best diving in Asia, offering itineraries only possible by liveaboard. Sixteen pampered guests can enjoy modern multimedia equipment, ample space for lounging and even a hot tub for relaxing. Expect creature comforts, great food and a welcoming crew. Dumaguete is the land-based sister resort of the Azores and is the start and end point of our trip on the liveaboard. This makes adding a few days at the resort a very sensible option! Dumaguete has fantastic muck diving, check out my pictures from previous trips to Dumaguete! Contact me for more information on extending! Mission Statement: We at Ocean Realm Images are extremely passionate about protecting the marine environment. The focus of our trips will be to observe and photograph marine life in an environmentally friendly way, without harming or stressing animals. We want everyone to enjoy their diving, but not to the detriment of the reef and its inhabitants. Join Wendy and Richard on an unforgettable journey to the frontiers of the world’s most biodiverse coral reefs on the majestic Dewi Nusantara | 21st January to 1st February 2016. Focusing on only the southern region of Raja Ampat provides the perfect opportunity to really explore this amazing and unique area. It allows us to visit areas that we wouldn’t ordinarily have time to see during a trip that also includes the northern islands. This 11 night southern itinerary will include a new perspective on Misool and it’s surrounds, starting off with the enchanting island of Batanta en route to Kofiau. Kofiau is one of Raja Ampat’s least dived areas, but an absolute hidden gem. Raja Ampat’s highest species diversity count was from Kofiau and this diversity is well protected within a Marine Protected Area patrolled by The Nature Conservancy. Due to the dominance of oceanic currents, Kofiau can have excellent visibility but there is also fantatsic muck diving. The island is even home to endemic kingfishers, pythons and butterflies! As always, Richard will be giving marine life lectures during the trip, so you can get more from your diving and underwater photography. To see Richard’s images from Raja Ampat please click here. For inclusions and exclusions please refer to the attached flyer below. For bookings and/or with any questions, please contact Richard or Wendy.